Deadlines, endless forms, constant college prep pressure at Mass. charter school — is the finish line in sight for these low-income students? This story is second in an occasional series on the senior class at Match High School, a college preparatory charter public school in Boston. This installment zeroes in on the hopes, dreams and challenges of six seniors applying to college. Read the first story here. BOSTON — By mid-November, Match High senior Aneudy Miguel Polanco has been late to school 15 times, but he’s quick with excuses. On top of a full college preparation schedule, he juggles baseball training and his job as a cashier at T.J. Maxx. He helps his single mom take care of two younger brothers and a newborn baby sister, and struggles to meet so many deadlines he sometimes doesn’t remember what week it is. “If Match ended at 2 every day instead of at 4, I’d have straight A’s,’’ Aneudy says, occasionally rubbing his eyes. In class the day before, Aneudy put his head down on his desk and grabbed a little shut-eye. Today he’s talking with his college counselors about what he needs to get done immediately; he knows he’s behind. At the same time, Daniel Inoa and Humberto Rojas, who push and encourage one another while competing to graduate at the top of the class, are waiting to hear from their dream schools. Both submitted early action applications: Daniel to Harvard, Humberto to MIT; they’ll find out Dec. 15. It’s more than a little scary. Harvard last year admitted only 2,037 of 39,041 applicants; MIT took just 1,511 from 19,020. Both Daniel and Humberto have parents who didn’t attend college themselves but who have huge expectations for their sons. Across the U.S., it’s make-or-break season for the college-bound, when seemingly endless and often overwhelming application tasks can create roadblocks for low-income students like the 43 seniors at Match, who come from largely poor and minority families and may not speak English at home. They generally don’t have parents nagging, cajoling and encouraging them to stay on top of complex and confusing application details. That’s where Match guidance counselor Shira Zar-Kessler and head of counseling Joanna Sanborn come in. Not everyone at Match will make it: Of 78 students who entered Match in the fall of 2013 as ninth-graders, 16 have either moved, transferred or no longer attend. Fifteen students are repeating 11th grade, while four are repeating ninth grade. “Don’t hit send [on the Common Application] until one of us looks it over!” Zar-Kessler warns during one of the twice-weekly counseling classes, where students are making lists of everything still outstanding in their applications, from sending colleges their most recent SAT scores to writing supplemental essays. Nationally, low-income students are more likely to drop out of high school and less likely to enroll in college. By 2014, just about half of low-income high school students enrolled in college immediately, compared with 81 percent of high-income graduates, according to the Commission on the Future of Undergraduate Education. Match students beat the odds; some 87 percent of graduates since 2004 have gone onto a four-year college, according to data Match submitted to the National Student Clearinghouse. At Match, the finish line won’t come till the end of May, when seniors reveal their college choices at a dramatic “signing day” ceremony before family members, counselors, tutors and nearly all the adults in their spacious and sunny school building. The kind of personal attention they get is unheard of in most public high schools, where a single school counselor has an average caseload of 491; in Massachusetts, the ratio is 419 to one. 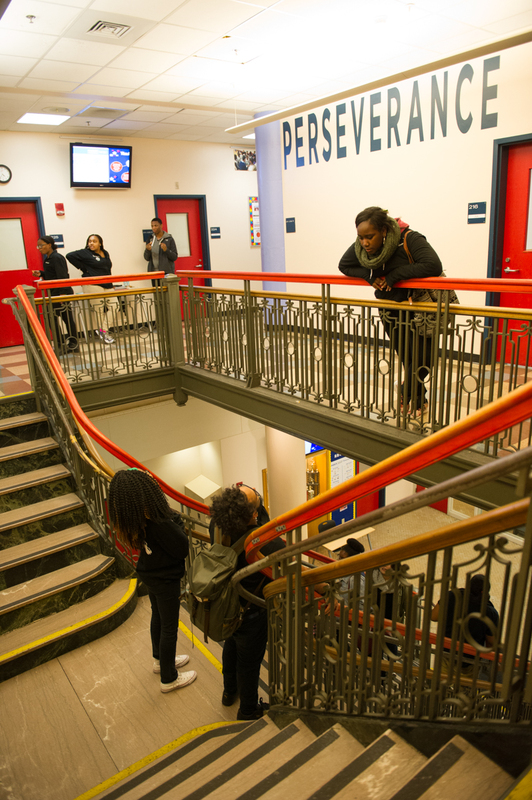 Students enter Match via an annual lottery; last year 2,134 Boston students vied for just 161 slots in the school’s pre-kindergarten through ninth grades, which feed into the 310-student high school. Match enrollment is now 1,149. Demand will likely grow because the supply will not: Voters in Massachusetts overwhelming rejected a ballot question last month to expand charter schools (62 percent rejected it; 38 percent supported it). Opponents argued vigorously that charter schools — privately run but publicly financed — drain money from traditional public schools, which educate 74 percent of Boston students. It remains unclear how the election of pro-school choice and voucher advocate Donald Trump as president will influence the nation’s charter debate going forward. 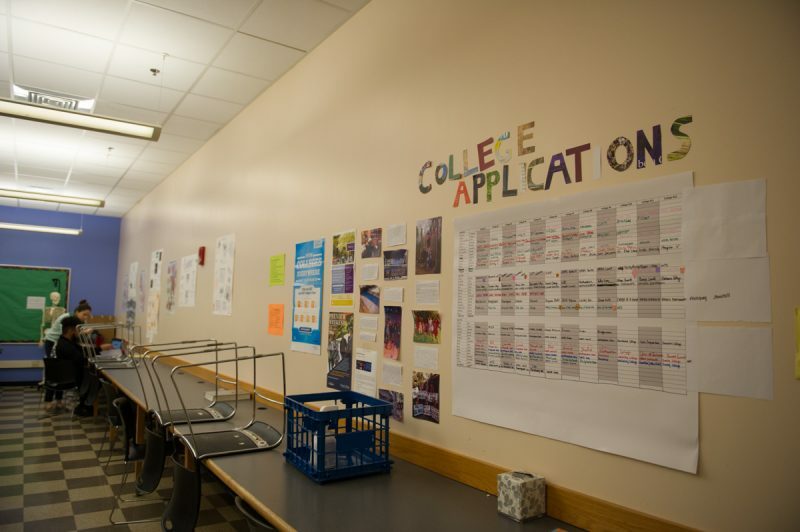 In the weeks before Common Applications to colleges are due, (many colleges call for a Jan.1 Common App deadline) seniors also worry about keeping up their first semester grades. Zar-Kessler wants students to submit earlier — she’s set a target date of Dec. 20, before winter break. Related: Will changes in online college applications help students chase American dream? Senior Michaela Notice, who hopes to get into UMass Lowell (the acceptance rate is 57 percent) and ultimately become a lawyer, is mostly done with the Common App. But she’s also balancing basketball practice, prom planning, step team and student government, while worrying about a low grade in Spanish. On a recent November evening, her mom shows up at Match for a conference with Spanish teacher Tiffany Kidwell. Michaela’s not looking forward to it, but Kidwell keeps the tone positive, and the three discuss ways she can boost her performance. “There are so many expectations on me,’’ says Michaela, the youngest of four; two are half-siblings. All are either in college or have attended. Earlier this fall, Michaela did poorly on a Spanish test on a day when she had a bad cold, then fell behind on a project when she was out sick. Today, Michaela is sore from the first day of basketball practice and just plain exhausted. “My attention has been on making sure the Common App is accurate and my personal statement is on point, and I can’t just forget about academics,’’ Michaela says. After the meeting, she and her mother thank Kidwell; she announces: “We have a plan,’’ and pledges to do better. She recently raised the grade from a D to a C+ and expects it will go up even higher. The college-going culture and intensive support for students at Match starts early, says Joanna Sanborn, director of college counseling and mother of a first-grader at Match Community Day elementary school in Hyde Park, the entry point for most Match students. 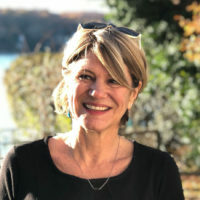 “I’ve had the chance to attend several events at my daughter’s school, and in kindergarten she was already writing about what she would learn if she was going to college,” Sanborn says. The early grades lay the groundwork for an enormous task: getting students sufficiently prepared for Match High School’s rigorous and traditional college prep curriculum, filled with demanding Advanced Placement courses. Not everyone will make it: Of 78 students who entered Match in the fall of 2013 as ninth-graders, 16 have either moved, transferred or no longer attend. Fifteen are repeating 11th grade while four have repeated ninth grade. Early on, Match recognized that some students needed to catch up, particularly those who entered in later grades and came late to the school’s philosophies and expectations. That’s partly why Match distinguished itself with a potent, high-dosage individualized tutoring program, geared to a student’s individual strengths and weaknesses. 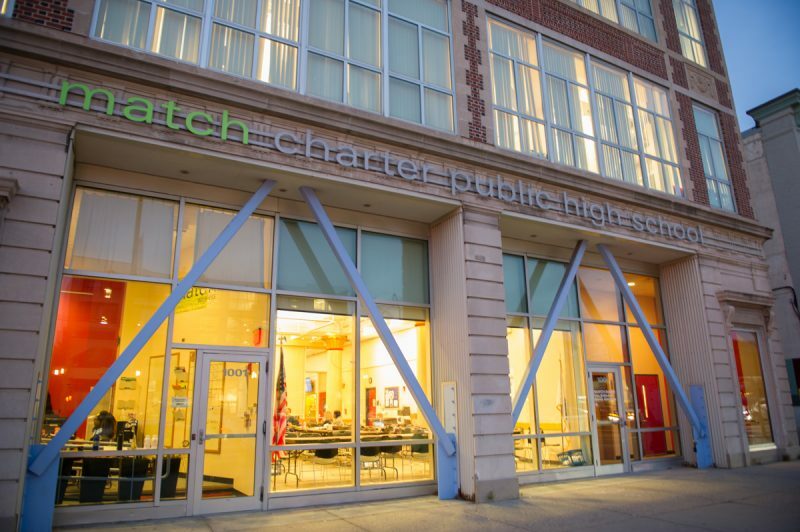 Match has helped school districts in Houston, Chicago and Lawrence, Massachusetts pilot the model, which is also being replicated in a new spin-off organization started by former Match educators. “We were getting students in high school [who hadn’t previously attended Match charters] and there was an immediate problem,’’ says Orin Gutlerner, chief academic officer at Match, who is also boys basketball team coach and founding director of Match’s teacher residency program and graduate school of education. Gutlerner says personalized tutoring plays a huge and helpful role in getting students up to speed, especially in ninth and 10th grade. The “Match Corps” tutors are high-performing recent college grads from the national service program AmeriCorps, who commit to a year of service in exchange for subsidized housing and a $15,000 government-funded living allowance. “In its best form, the tutoring is tailored to what the student needs to be successful. It’s also about keeping them motivated toward achieving a goal,” Gutlerner says. “My other friends who don’t go to Match, they get out at like 2, and they have the whole day to go home and take a nap,’’ Aneudy says. He also thinks college might be easier, especially if he lives on campus. “My friend who goes to college, he’s just chilling, he has so much time,’’ Aneudy says. Humberto Rojas, now an academic star, relied heavily on tutors at first; he reluctantly entered Match middle school in sixth-grade, after attending a neighborhood public school with “no rules…I was apprehensive about three hours of homework.” He says the workload at Match was “a shock,’’ and at one point Humberto told his mother — a housekeeper originally from Mexico — that it was too much for him. “She told me to just push through,’’ he says, and now Humberto is glad that he did. His father — a chef who works two jobs — often drops Humberto off or picks him up at school. He loves telling friends his son might go to MIT: if Humberto gets in he’ll be the first Match student ever to attend. “My love for math and science began here,’’ Humberto says. He also found the tutoring system flexible and tailored to his needs. By ninth and tenth-grade he was sharing a tutor with Daniel Inoa because the two learned the material so quickly. Daniel, who never had a grade lower than A-minus, has experienced rejection before; he didn’t get into a summer program at Franklin & Marshall College and it became the topic of his college essay. He describes how he feared facing his older sister, a former Match student who attends Brandeis, and his mother, who works as a secretary. His father is a maintenance man but no longer lives with the family. “My mother is a woman who constantly brags about her son’s accomplishments. I struggled and persevered through school in order to make her feel proud of me,’’ Daniel writes. “I could just picture on her face the pity, and the disappointment.’’ He adds, however, that rejection ultimately helped him “build resilience,’’ and gave him a chance to study at the summer academy at Noonan Scholars, a nonprofit organization that supports low-income and first-generation students throughout their senior year. 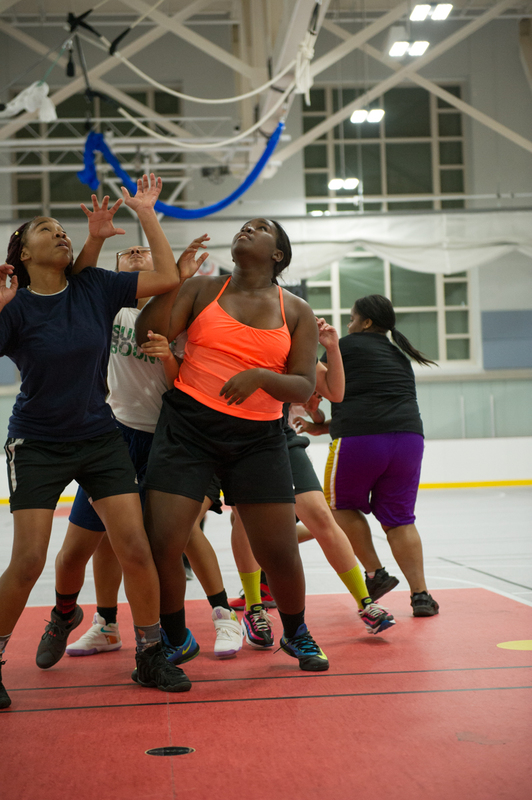 Such outside opportunities play a part in the success of Match students; the school looks for worthwhile summer programs that offer scholarships. Michaela Notice spent 15 days last summer canoeing, rafting, hiking and camping in Utah and Colorado, via the National Outdoor Leadership Program, (NOLS). Humberto attended Crimson Summer Academy at Harvard. Brinda Lamarre spent a summer in South Africa, via the Experiment in International Living, learning about multiculturalism in rural and urban societies.. Serena Walker-Jean, whose dream school is Brown, spent three consecutive summers fueling “an uncontrollable love for math and science,’’ at (MS)2, Math and Science for Minority Students, at the elite Phillips Academy boarding school in Andover, Massachusetts. How will they afford it? In the months to come, as Match students start hearing from colleges, their conversations and dreams will shift entirely toward the question of what they can afford. Most require government subsidized Pell Grants, scholarships and other financial aid. Many are still struggling with the detailed CSS/Financial aid profile and will soon face the daunting FAFSA forms, so Match has financial advisors from the nonprofit uAspire coming to the school once a week to help them out. Match seniors worry constantly about paying for college. On average, low- income students pay more than three-quarters of their annual family income out-of-pocket to attend a four-year, public or private nonprofit institution — nearly five times the proportion of wealthier families, according to a new report by the nonprofit Education Trust. Students from low-income families are vastly less likely to attend top colleges than wealthier Americans with similar academic ability. Advocates and foundations such as the Jack Kent Cooke Foundation (among the various funders of The Hechinger Report) are calling on colleges to do a better job helping low-income students overcome the many obstacles that keep them from selective colleges; at such colleges “rich kids outnumber poor kids by 24 to 1,’’ notes author and scholar Richard Kahlenberg of the Century Foundation. Aneudy figures he’ll have no choice but to take out loans. He’s also focused on finishing his essay and finalizing his list. One thing that keeps him going: he refuses to believe that college will be more tiring than his schedule now, especially if he gets to live on campus. Earlier this fall, he accidentally overslept and almost missed taking the SAT exams. He made it with just a few minutes to spare. Zar-Kessler, meanwhile, is preparing students for the next step: how to regroup if the news from colleges is disappointing. “We have a workshop scheduled for January,” she says.